On May 23, Dr. Tedros Adnahom Ghebreyesus was elected as the new Director General of the World Health Organization (WHO). He took office on July 1st, succeeding the outgoing Director General Dr. Margaret Chan, who has held the office since January 1, 2007. Dr. Tedros is the first director general to be elected by the 194 member countries as a whole. Dr. Chan was elected under the previous system in which the WHO’s executive board — consisting of a rotating committee of 34 member countries serving three year terms — decided the matter. Tedros, 52, defeated Dr. David Nabarro, 67, of Britain and Dr. Sania Nishtar, 54, of Pakistan in the campaign to take the position. He is seen to have benefited from endorsements from the African Union. This is the first time an African has held the position, an outcome that has been met with a large amount of praise, with many hoping this will bring renewed focus to the widespread health issues affecting the continent. Tedros benefits from an extensive educational background focusing on biology and health. While not a physician, he holds a doctorate in community health obtained at the University of Nottingham, UK in 2000. Tedros has a Master’s degree in the immunology of infectious diseases from the University of London, as well as a Bachelor’s degree in Biology from Asmara University in Eritrea (formerly Ethiopia) in 1986. Data on HIV prevalence in Ethiopia is varied, and some question Tedros’s claim. All sources do, however, agree on a consistent downward trend. The 90 percent figure given in the CV would seem to be an overestimation; the actual figure from a 2003 to 2012 timeframe is a reduction from 4.4 percent to a 1.3 percent prevalence (although the 90 percent reduction can be claimed for a 2001-13 timeframe.) This is closer to a 70 percent reduction than 90 percent. This downward trend had been in place since before his time in office but is an impressive reduction nonetheless. Tedros’s tenure also saw marked improvements in child and maternal health; deaths from malaria; accessibility of treatment for several infectious diseases; and the accessibility of family planning services. Tedros’s track record is sufficiently impressive that he claimed numerous high-profile endorsements, including from the African Union (AU); a number of political leaders past and present; and several senior figures from the global medical community and the field of international development. Tedros is not held in high regard by all, however. In the months leading up to his election there was extensive campaigning against him, citing cover ups and human rights violations during his time as part of the Ethiopian government. Aside from rivals to the post from other nations, Tedros had to fend off protests from Ethiopian exiles. Protesters claim that, during his time in government, Tedros was complicit in the arrest and torture of political leaders as well as those who “challenged the status quo”. In health related matters Tedros has been marred by the accusations of cover ups regarding an outbreak of cholera in Ethiopia between 2008 and 2011, during his time as Health Minister. 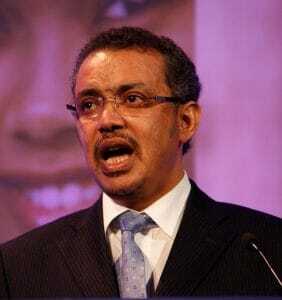 Tedros denied the accusations, which were made public in an article by the New York Times, and deemed them slanderous. However, a former Reuters reporter who had documented the outbreak in 2009 spoke out and claimed the accusations were consistent with what he observed. WHO officials voiced concerns at the time that the outbreaks were not being reported by the Ethiopian government. At the time they were dismissed as simply being “acute watery diarrhoea” in remote areas where laboratory testing was unavailable. This explanation has been used in further outbreaks and is still maintained by Tedros and the Ethiopian government to this day. There are a number of potential aims that Dr Tedros may seek to address during his time as director general. One of the most pressing issues to the WHO is the matter of funding. Currently the WHO has a two year budget of $4.4 billion USD. This has remained consistent for years and is a limiting factor when the expectations of the role played by the WHO are ever increasing. Following a slow response to the 2014 West African Ebola outbreak, many were critical of the WHO; This was not entirely without substance, as Dr. Margaret Chan herself has admitted. Yet there were no talks of funding increases to help cope with any newly emerging healthcare crisis. Under its current system, 25 percent of funding comes from involved nations, with a further 75 percent donated by non-state donors on a project-by-project basis. As funding must be raised for a specific project, rapid response to an emerging crisis is not something this funding system is capable of dealing with well. The Wellcome Trust, in an open letter to Tedros, has asked that issues such as drug resistant infections and environmental impact on health be brought to the forefront of priorities. Drug resistant infection is likely to be a primary concern over the period of time Tedros is director general. As with the Ebola crisis. this is a matter of grave concern that requires a rapid response. The longer it is left the more drug resistance becomes prevalent. If left unchecked this could render a majority of currently used antibiotics useless in the fight against many diseases. Multi-drug resistant tuberulosis (MDR-TB) is an example of this issue. In South East Asia a number of countries are now reporting emerging cases of extensively drug resistant TB (XDR-TB), which is all but untreatable. His appointment as the first African director general could see the WHO place a renewed emphasis on sustainable development and healthcare goals in the poorest of nations. In the coming months we will see Tedros take up his new role, at which point his intentions for the future of the WHO will become clearer.